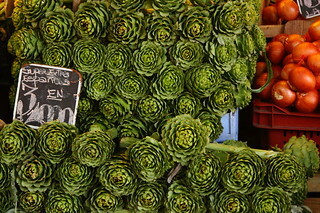 Vegetables for sale at the Mercado de Abastos in the Plaza Tirso de Molina. Santiago, formally Santiago de Chile, is the capital of Chile and the center of its largest conurbation. It is located in the country's central valley, at an elevation of 520 m (1,706.04 ft) above mean sea level. Founded in 1541, Santiago has been the capital city since colonial times. The city boasts a downtown core of 19th century neoclassical architecture and winding side-streets, dotted by art deco, neo-gothic, and other styles. Santiago's cityscape is shaped by several stand-alone hills and the fast-flowing Mapocho River, lined by elegant parks such as Parque Forestal . The imposing Andes mountains can be seen from most points in the city.